Capture from video on Iwantv. Producers of the noontime show ‘It’s Showtime’ seem to have a fetish for being summoned by the MTRCB. As if the show had not been called to the office of the regulatory board often enough in the past for airing ‘inappropriate’ material, last Thursday it lived dangerously again by way of a seemingly innocuous but nonetheless totally bawdy tongue twister used by Kuya Kim in the ‘Ansabe’ segment. 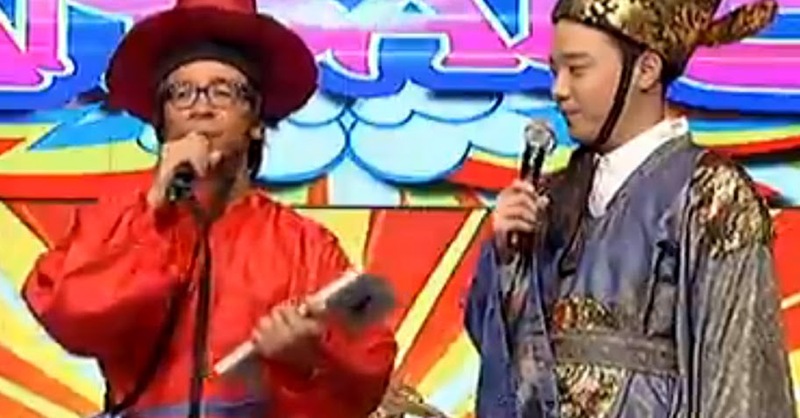 Regular viewers of the show know that as a prelude to the lip-reading game Ansabe, Kuya Kim gives Ryan Bang tongue twisters ostensibly to help the Korean actor practice Tagalog phonetics. In truth, all the tongue twisters ever do is to capitalise on Bang’s verbal shortcomings to draw laughs from the audience. To be perfectly fair, the ploy is often hilarious. As kids, we used to double over in laughter at this shamelessly bawdy tongue twister, the singular purpose of which has always been to trick a person into saying out loud a delicate part of the female anatomy. I do have a sense of humour and I will not be a hypocrite by denying that the tongue twister is funny. Neither am I a prude; and among friends, I will find nothing wrong with it at all. But on national television? I am a fan of Showtime and watch it every day without fail. It is because of this that I get annoyed when its writers, despite the frequent summons by the MTRCB, never seem to quite grasp what is appropriate and what is not. Almost every Filipino invariably falls for the trap of tapiko takupe, especially when done at real speed. To ask Ryan Bang, whose grasp of Tagalog phonetics is severely challenged to say the least, was nothing short of stupid. That was why I watched anxiously as Bang bravely tried to enunciate the tricky syllables of the tongue twister on national television. In fairness, he managed not to fall into the trap. On the other hand, perhaps because he is not Filipino and was particularly deliberate and slower with his pronunciation helped him not to. It was still living dangerously, and I will not be surprised at all if producers get summoned again. When the cameras panned out to Teddy Corpuz and Jugs Jugueta to get the game started in place of Jhong Hilario, it was the former who heaved a sigh of relief. “Bakâ kung ano pa ang masabi,” Corpuz muttered. In other words, he was being wary of an MTRCB summon, something that whoever the writer was who proposed the tongue twister ought to have thought about in the first place. Meanwhile, if you are hearing of this tongue twister for the first time, I am sure you are anxious to try it out yourself. Smiley.